In my family, I'm known as the blabbermouth. Can't keep a secret. I've become better at it, but secrets eat away at me inside. I HAVE to tell somebody. I've got awesome new things going on at the studio, new summer designs, new wedding designs, new super awesome clients, new super rad custom designs for clients, and super rad collaborations in the works. And I want to share them all. 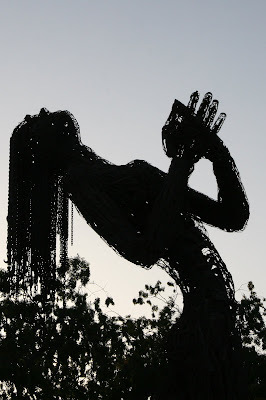 People who come over to my home see the new projects in production, why shouldn't my blog readers? But I'm a grown up now. I need to start to learn restraint and control. The collaborations aren't set in stone, my wedding invitation's pages needs to get built, and so on and so forth. I'd hate to share something that eventually won't happen, so for now, I need to keep my mouth shut. But there are lots and lots of fun and exciting things going on at the studio! I will share one of the exciting things that happened the other day is that I showed my husband how to do something on Illustrator. Now, this might sound silly to you, but my husband is a wizard at Illustrator and usually it's me bothering him on how to do something in Illustrator. In fact, he drew out a concept for me last year that I'm just now putting into production and is working to digitize our great artist friend Matt Cox's work for Joie Studio. (Was that sharing one of the secrets??? See? Blabbermouth!) My husband is a 3d artist and I know you've seen his work because he's done 3d modeling for some major toys, movies, commercials, and video games. But I was finishing up a new design and when he saw what I was doing and asked how I did it. When I showed him my method in Illustrator and he was impressed by it, I was floored that I knew something about Illustrator that he didn't. Anyhow, Saturday's always a busy day around here, so I'd better start my day! 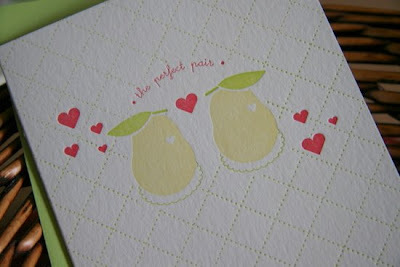 Till later, I promise I will share letterpress yumminess soon! 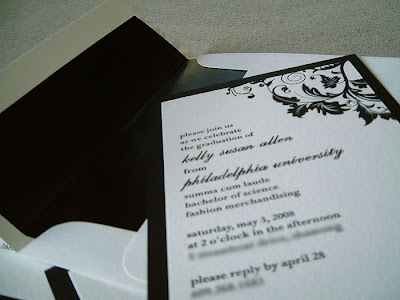 One of my clients sent me these pictures of her graduation party invitations, all assembled. 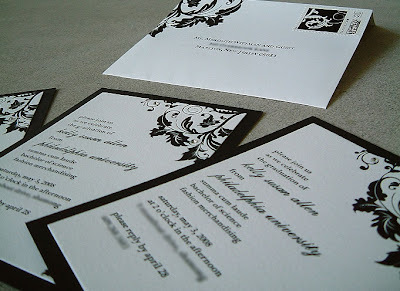 I printed these invitations for her on bright white cotton paper, and she mounted them on black and lined and printed her own coordinating envelopes. Aren't they gorgeous? I've been noticing a lot of my clients are adding rhinestones onto their invitations, for that special extra touch. Ugh. It's past midnight in New York and I'm still totally overstimulated from today. I meant to take pictures to share, too, but I was just so distracted trying to get through as much of the show as possible before my brain fizzled out from all the different colors and paper greatness going on. 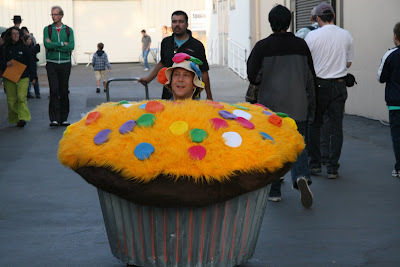 Plus all these vendors were giving out candy, cookies, and cupcakes. And somewhere in the middle of everything Haagen Daaz was there giving out free ice cream. It was like, paper, paper, ice cream, paper. I was in a paper and candy land, and it totally screwed with my grip on reality. After the free ice cream, everything seemed very surreal. There is only so much I can take in before my mind goes to mush, so it's lucky that I've allotted more than one day at the National Stationery Show. Today I was definitely feeling the California love here in NYC, if you can believe it. I met a bunch of letterpress printers from Pasadena and Los Angeles, and the ladies from Hello Lucky were as friendly as ever. As one of the suppliers I was talking to noted, "I've talked to more people from California today than any other place." Maybe Californians are just chattier. I also saw Grace Bonney of Design Sponge taking pictures. What's funny is that I wouldn't have recognized her except that on Sunday my friend Brooke and I were on our way to the Brooklyn Museum and I saw a big blown-up picture of her on an advertisement for some residential building being built. It's back to the National Stationery Show in the morning. I am going to try to stop by Kate's Paperie first, though. I passed by the Soho store on Saturday and I really want to go in. So here's hoping I can get past all the sugar and caffeine in my system to go to sleep and get to more scouting and scoping in the morning! Thank You to hapa | hale & Poppytalk! Thanks very much to hapa | hale and Poppytalk for announcing our online shop! 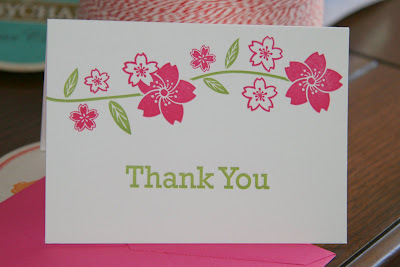 And, I'm very happy to preview (above) our Sakura Matsuri Thank You cards in bright summer colors. Let's call it Summer Sakura Matsuri. Sometimes I get so excited when I think about all the cool, fun designs I'm printing and what fun products I'm dreaming of next! If only I had more time! More to come, and I'll let you know when I list these in the shops when I return from New York City! Okay okay okay...I've been working on this puppy for a really long time, and I've finally finished! Introducing Joie Studio's new online shop! I'm very excited about it, as it gives me a good way to run promotions that involve coupon codes. I have exclusive Joie Studio pricing (of course) for a lot of my items in the shop, and you have the ability to order backordered items, and multiple items of any listing in the shop. For my blog readers, I'm offering a special 20% discount off of a purchase of $10.00 or more (limit 1 per customer, offer ends 5/31/2008). Use coupon code 'BLOG20' at checkout for your 20% off. Countdown to the National Stationery Show! 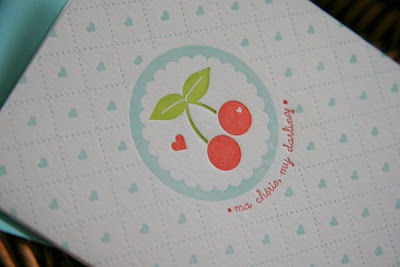 I am trying to wrap up projects here before I take off to New York City for the National Stationery Show. No, Joie Studio does not have a booth there. 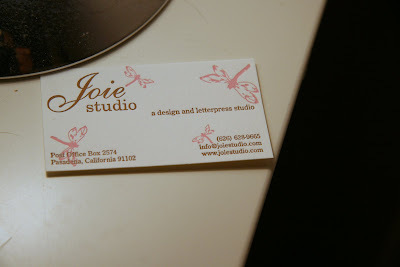 But I want to check it out to see if at some point in time, Joie Studio should have a booth at the National Stationery Show. Plus I'm always on the lookout for new paper suppliers, new envelope suppliers, and I am going to bring a bunch of business cards so I can network and meet other letterpress printers. I am also very excited about The Supply Side, which is a supplier fair that overlaps with the National Stationery Show. I *heart* New York City. It's been about 2 years since I've been back there, and I've got old friends who live out there that I haven't seen in about as long, so it's a mixed business-pleasure trip. 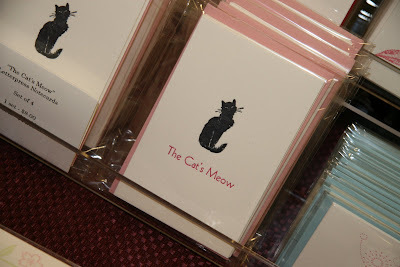 I'll hopefully remember my camera, and share with you everything I see at the National Stationery Show! Any tips on booths I should stop by and visit? Love Fruits: Up Close & Personal! What's this new logo? Well, since Shop Toast & Joie Studio's collaborations are going so well, I decided that we needed our own special logo that incorporates both of our logos and both of our websites. 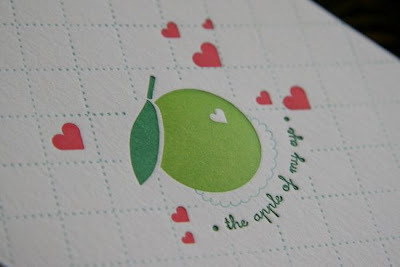 I know I gave you all a driveby glance of the Love Fruits last week in my pictures of Bazaar Bizarre, but here are some closeup pics of the Love Fruits, so you can admire Michelle's design and my letterpress printing! The final one stumped us for awhile on what to use as the "love fruit" phrase. I sent a bunch of ideas to Michelle, and she selected one for the card. 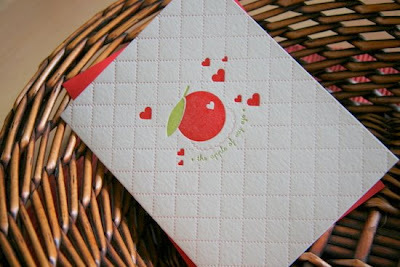 Last week, it was the most sold Love Fruit card sold at Bazaar Bizarre, mainly because people felt it was the Love Fruit card best suited for Mother's Day! They are currently available on Etsy as a set and will eventually be available in singles at retail locations in Honolulu and Menlo Park! I'm trying to decide whether or not to sell them singly on line, but you'll be the first to know! Some weeks just fly by and then suddenly it's Friday and I don't remember where my week has gone. I have been so so busy. Most of the time, it's just me and the cats and the dog. Don't get me wrong, I've got a great support group -- without my husband and my good friends Joie Studio wouldn't be where it is today. But most of the time, it's just me. Like this week, I got back and immediately set to work finishing up some custom letterpress projects for one of my very best clients. I had to run to meet with my local ink guy to pick up some ink and work out my accounting with them. There were estimates and wedding proofs to be sent out and a holiday line (yes, a holiday line) to be finalized. All of yesterday, I worked on some special designs that I will debut as part of the Sampler's MTV Style Lounge Gift Bag for the MTV Movie Awards. Then of course, I had to figure out what papers and envelopes to use. I've still got my baby line, which keeps getting pushed back, and two new wedding collections that I need to build out the web pages for. AND I've been working on an online shop for my website, off Etsy, which is also on the to-do list. But today, first things first. 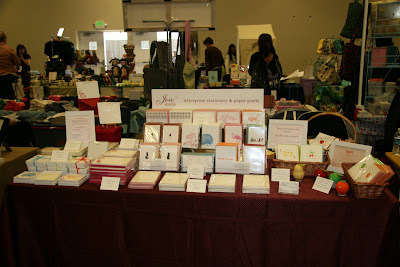 I need to go downstairs and grab all my new cards that I debuted at Bazaar Bizarre to photograph. Then sample packs need to be sent out today, as well as products for a store in Menlo Park, before the postal rate change! Busy busy Friday! Ah, Mr. Otter, we barely knew you! I knew otters were fast. And I knew people loved otters. 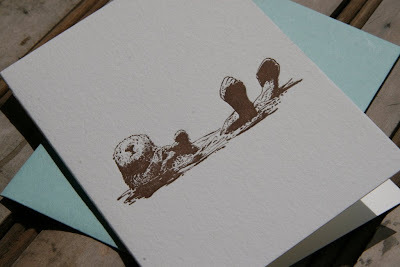 But what I didn't realize was how fast the otter letterpress card packs would fly off my display this past weekend at Bazaar Bizarre. I mean, I was getting all these stories about how people LOVED otters. I saw a wrist tattoo that said "OTTER." A nice lady told me she learned to dive with the dream of one day diving with otters. Men came up to me and told me that they NEEDED to buy the otter cards. Mr. Otter had a very nice weekend up in San Mateo, majorly upstaging his neighbor Mr. Peacock. And now he's completely sold out. Completely. Not one left. He's now high on my list for a reprint, so don't panic if you wanted some otters in your life. Mr. Otter will be back soon! 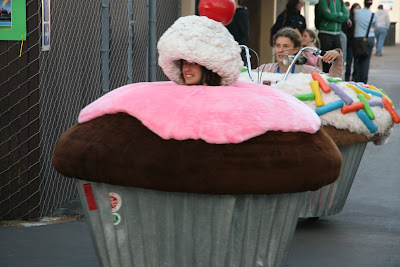 Maker Faire's West Coast Cupcakes! 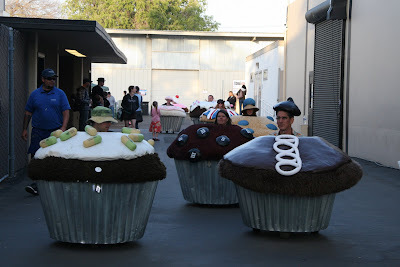 So, to give you a taste of the fun and bizarreness of Maker Faire, here was one of the conversation points of the Maker Faire that we witnessed - the West Coast Cupcakes! 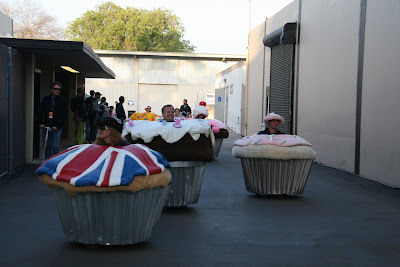 I talked to pink with sprinkles the next day at the Joie Studio table and he said that the project was originally conceived as a way to get around Burning Man. Makes total sense. 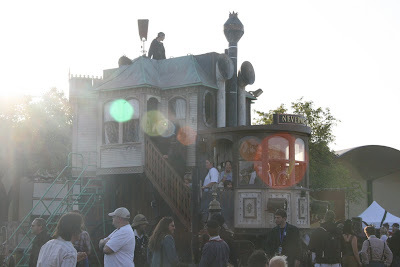 By the way, to the guy who was with the Neverwas Haul that I talked to at the table (yes, a lot of cool people randomly stopped by Joie Studio's table), here is the link to the Jules Verne Adventure Film Festival in Los Angeles, CA. 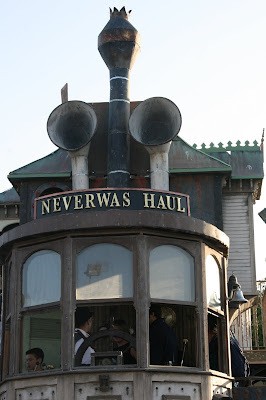 The Neverwas Haul, inspired by Jules Verne, was parked right outside Cypress Hall where Bazaar Bizarre was. It's a 3 story Victorian house on wheels! 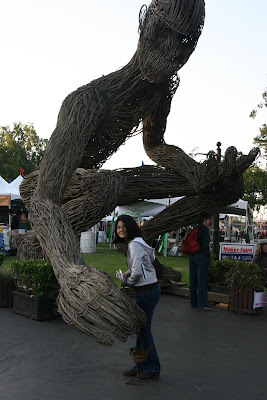 This guy was made out of rope. He's pretty rad. There I am with him, just to give you scale. 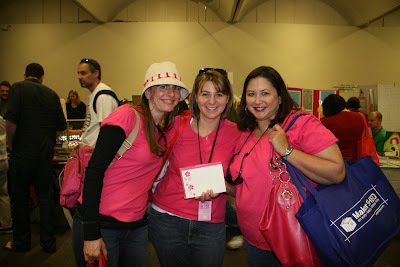 Team Unraveled Walks for Breast Cancer! I think what they are doing is completely admirable, and I invite you all to learn more about these knitting, walking ladies by visiting their website. Hello from Bazaar Bizarre at Maker Faire! I wanted to share some photos that we took this morning before the fair opened of our setup and all the fun new products we're selling today and tomorrow. Bazaar Bizarre at the Maker Faire This Weekend!!! Hey all! So I'm leaving tomorrow morning for the San Francisco Bay area. ROADTRIP! 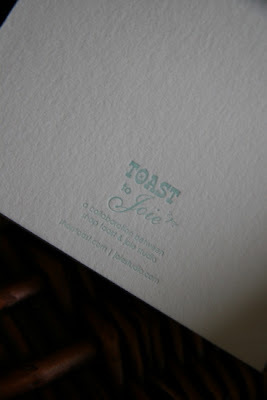 I will have custom letterpress samples, including some samples of letterpress wedding invitations. If you visit me at Bazaar Bizarre, I can do an initial consultation with you on your custom letterpress project. We will be taking custom letterpress stationery orders at a special price at the fair, which are the perfect gift for Mother's Day, graduation, and birthdays! 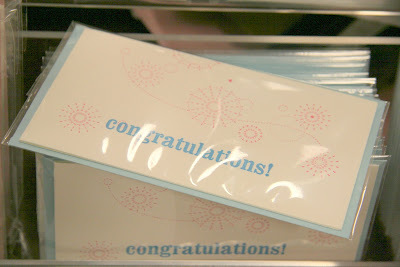 And, if it's a gift, we'll give you a free letterpress greeting card from our "Plain & Simple" collection to fill out. 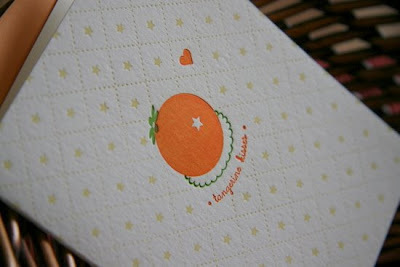 We'll have special discounts on our letterpress stationery, cards, and coasters! We are going to be debuting our new Spring/Summer collection, including an exciting collaboration with Shop Toast! There's a special Mother's Day gift that we'll be taking orders for that I'll tell you more about. It's handmade and deliciously loveable! See you at Bazaar Bizarre! ...well, "die" is a strong word, but I'm leaving in Friday morning for Bazaar Bizarre at Maker Faire in San Mateo, CA. Everything that I'm bringing needs to get done by tonight. I did a whopping four colors yesterday and printed for seven hours. In the middle of it I discovered that I had inadvertently altered the design of a new Shop Toast/Joie Studio card by submitting a plate cut up incorrectly and had to make a frantic phone call in the middle of my green run. 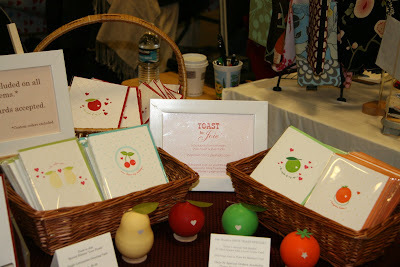 It's my goal to debut the new Toast to Joie greeting cards at Bazaar Bizarre, and there's five of them. And they all have at least (yes, at least) three colors each. I still have two colors to go and then I have to score everything. AND I have to take the pets to the vet today. AND I have to pick up some new metallic silver from Accent Ink for a client job next week (thanks, Jezebel). I'd better start my day! PS - Here is the new business card. Some of you may recall that I changed my phone number at the start of the new year. I've been lame and have been crossing out the old number and putting in the new number. With the fair creeping up on me, I really did consider whether or not to just bring the old cards and continue crossing out the old number. But I decided against it and actually printed new business cards. Here's my "new" business card. It's in a little bit of a different color scheme, but mainly because I just used the metallic bronze that was on press the other day so as not to add another color to my printing load!